Tin Man sightings have dried up recently. So where is he now? I work with Ted in Derby. Former Queens favourite Kevin McMinn (A.K.A. Ted) has been appointed assistant manager to former England star Mark Wright at Southport. The ex-Q.O.S. 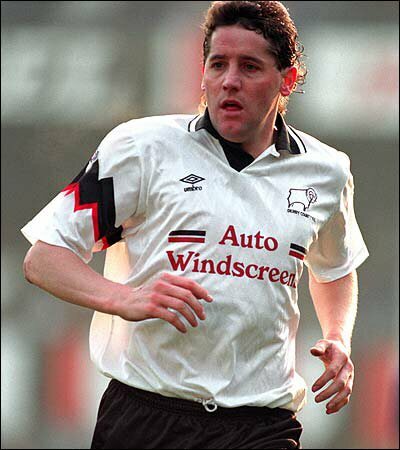 hero was managing Derby County's under-15's when he was offered the job of number two at non-league Southport. I'm not sure where he is now. Last heard of playing for Burnley. I always remember him after home games at Palmerston though. By around 8 pm you could always find him in the Golden Bull (now Thorntons). Last season (97/98) was set to sign for Perth (West Australia) Glory..or did sign but only played a couple of games. Maybe as soccer is played here in summer which can be a touch warmer than Dumfreeze on a Jan evening. My mate was going to Ayr the other day when he saw the mighty Ted walking along the street in Coylton, Ayrshire (on the A76). I've had it confirmed that Ted is definitely living in this area now. Gets around, doesn't he. Ted McMinn came to Perth in Western Australia for the 1997 season and played in the local state league for a team called Joondalup City. He also tried out for the local Australian National League Team called Perth Glory (I'm not making that name up) but for various reasons was not invited to sign for them. Last I heard he had returned to Britain for financial reasons. He certainly didn't play in Perth this season just finished (1998). If I can find any more information I will e-mail to you in future. Queens played a friendly against Kilwinning Rangers who were managed by none othe than Ted McMinn! Also playing for them were Tommy Sloan and Norman Montgomery.